Netflix is an online streaming service which provides users access to a wide genre of movies and web series in 190 countries (at the time of writing this article) around the globe. Considering the fact that there are 195 countries on this planet, we guess it would be safe to say that Netflix is available all across the globe. This media service provider has gained a lot of popularity in recent years and stands strong with more than 145 million subscribers around the world. ‘Netflix and chill’ seem to be one of those terms which you may get to hear even after you are in a colony on Mars. However, there would not have been a need to write this article if everything was going smooth. Netflix seems to be on a war with our beloved VPN services. The frequency of the error messages on this media streaming service for the use of proxy and VPN services is on the rise. So why is Netflix not letting people use proxy and VPN services? Why are people even using VPN services to watch movies on Netflix? How does Netflix get to know if a person is using a VPN service? And most importantly, how can one stop Netflix from knowing if the person is using a VPN service? You will get an answer to all these questions in this article. Even if you know the answer to some of these questions, it will be worthwhile to go through the rest. Before the advent of online streaming services such as Netflix, Amazon Prime, Hulu, etc., people did not have the luxury of watching the latest and greatest movies from the comfort of their couch. Instead, one would either need to go to the movie theatre, or buy/rent the DVD of the movie, or wait for the cable network operator to telecast the movie once it gets old enough. Some of these old methods to watch a movie still exist, and these are also the ways through which the distributors make money. Movies and shows are generally made for the audiences of a specific geography, and therefore, the distribution rights for the same content are sold at different prices in different places of the world. There are other players along with Netflix which bid for the streaming rights. This makes ways for the possibility that Netflix may get the rights to stream a movie in one country, but when it comes to some other country, another party has acquired the rights. This bounds Netflix to be selective of what they stream in different parts of the world. It is why you will find significantly more content in the library for US viewers when compared to the one for the United Kingdom. The subscription fee for the service also varies across different regions on the globe. For instance, the Asian users are charged considerably lesser than what the European users need to pay for the service. There are reasons other than the availability of content for the different prices in different parts of the globe. It will be going on a tangent if we start discussing the pricing policies of the service in this section. The crux of the matter is that Netflix just doesn’t have the rights to stream specific content in certain parts of the world. Therefore, if you are sitting in Australia trying to watch ‘Pee Wee’s Big Adventure’ or ‘Whatever Works,’ then you might have to take help of a proxy or a VPN service. And it is what people had been doing until 2016 when Netflix decided to employ robust measures to prevent people from watching the geo-blocked content using VPNs and proxies. After 2016, it is becoming increasingly difficult for the users to watch the restricted content of Netflix even after the use of IP masking services. The service started banning the VPNs, and it is still doing so. The service is constantly evolving to find ways to detect VPN and proxy connections and ban them. It is natural for one to wonder what were the reasons which suddenly made Netflix go all guns blazing against the VPN services. Before 2016, Netflix had the same policy of controlling the access to geo-restricted content which most of the streaming services still have. It is to put on a geo-restriction on the content and then turn a blind eye on the circumventions stating that they did what they could. However, when you watch a movie on the service by bypassing the geo-restriction, the distributor with the rights of the movies loses his share of the money. It is no brainer that no business wants to lose money or even make less money. Since Netflix is one of the giants when it comes to streaming content, it is only natural that the people will abuse this service the most. Soon the distributors and the media houses started pressurizing Netflix to take concrete action against the violation of the geo-restrictions applied on the service. Even though Netflix has started producing its own content and, it still depends largely on the content created by other production houses. It had no option but to act on the issues raised by the distributors and media houses. Netflix stated that they also want to cater the content on a global scale, but the process will take a long time. In the meanwhile, they need to respect the contracts between the distributors and the production houses. It is understandable that Netflix has all the rights to stop people from bypassing the geo restrictions, but the current system in place does not let the viewer use a VPN at all. The primary function of a VPN service is not to bypass the geo restrictions but to help the user stay safe on the internet. It was the need to preserve privacy and stay safe from the surveillance systems of the governments and other groups which called for the need for VPNs. Even if a person is using VPN to safe keep her privacy and not to bypass the restrictions put in place by Netflix, the streaming service will not let the user watch any content until she disconnects from the VPN. We can go on for days explaining the importance of online privacy and VPN these days, but we guess we have got the point through to you, the readers. The restrictions put together by Netflix sometime happen to interfere with the privacy of the user which should not be acceptable. Otherwise, it is only a matter of time when other services will start walking on the same lines, and privacy on the internet will become a myth. How often has it happened that you sat all tucked in and cozy on your couch with popcorn and a glass of wine to binge watch your favorite show and as soon as you start streaming this streaming error message pops up. You might have been using the same server on the VPN service for months to watch Netflix and all of a sudden; you just can’t stream using the same server. This is because the streaming service keeps looking for connections which use VPNs instead of being inactive and blocking just the known few VPN exits. Let us first try to understand how a VPN or a proxy service help the user bypass any geo-restriction. The terminating points of the internet connections are identified through the IP address. It can be considered analogous to your home address. Just like your address has various components which range from country to the street name, in the same way, IP addresses tell a lot about the location of the end user. When the user sends a request to a service, the IP address informs the service about the location of the user. If one can successfully mask his location and show the IP of some different location, then the service will think of the users as from the masked location. To bypass the geo-restrictions, the user will need to mask the location as the one which the service entertains. VPN services use the same methodology to bypass geo restrictions. A VPN redirects the user’s internet traffic through other servers which then changes the IP address of the user. So, if one wants to get access to the shows on the Netflix US content library, he will have to connect to a VPN server in the USA. This will show the user’s location as from within the US, and he will get access to the contents of the library. This is how things used to work before 2016. Now the chances are slimmer that this method will work irrespective of the VPN service in use. A few VPN services are still able to bypass the geo restrictions of Netflix. But there are only a ‘few’ of these services left. There are a lot of speculations when it comes to the methods used by Netflix to ban the VPN connections on the service. However, among all this uncertainty, one thing is certain, and it is that Netflix does the job of detecting proxies and VPNs very well. Let us briefly discuss these possible methods used by Netflix to stop the harmless binge watchers from accessing the geo-restricted content even with the use of VPN services. The most obvious and the most discussed method which the service can use is the blocking of shared IPs. When a VPN service redirects the user’s traffic through one of its servers, it assigns the same IP address to all the users connected to the server. This helps in keeping the user anonymous as it becomes tough to filter one user from the sea of other VPN users. But a shared IP address also makes it easy for the services to identify it and relate it to a VPN service. The service then bans the IP address, and therefore, the users cannot access the service through the server anymore. Shared IPs are also easy to detect because they stand out from the rest because of the unusually large data consumption. To counter the issue, a VPN service may then provide a private IP address to the user, but the streaming service has got a trick up its sleeve for this as well. Generally, the VPN services buy IP addresses in bulk. This group of IP addresses is easy to identify because they are in the same order. When the service finds out about one of these IP address and its connection to a VPN, the whole subset of the IP address gets banned on the service. The next speculated way which Netflix might be using to detect VPN servers could be to find out if there is a mismatch in the IP address and the DNS server. It is an easy way for the VPN services to identify those VPN services which don’t have private DNS servers and use third-party DNS servers such as Google Public DNS servers. When the service finds out that the IP address and the DNS server don’t match, it ends up banning the IP address. It is therefore recommended to use a VPN service which manages its own DNS server. The speculations aren’t over though. We have still got some left in the bag. One such guess is that Netflix just blocks popular VPNs which are known to be used by a lot of people. However, we doubt this one as there are still a lot of popular VPN services out there which can successfully bypass the restrictions applied by Netflix. And now is the time for a trivial one. We found one gentleman stating that Netflix uses ‘Locale checks’ to identify the location of the user. This speculation came to life when this person found out that changing the default language of his device from English (UK) to English (US) somehow stopped the blocking of VPN connection. We are ourselves speculative of this speculation, but it was worth a mention for sure. Even though we did not reach a conclusion on what method Netflix is using to detect VPN connections, we have established the fact that a service has multiple ways to detect a VPN connection. Just like services have lots of ways to detect a VPN service, similarly a VPN can also employ numerous methods to bypass the restrictions. But it is also important to know if it is legal to stream geo-restricted content on Netflix using VPN. Let us first address this topic in respect to those countries which don’t allow the use of VPN itself, let alone specifically for a service. Using VPN in such a country would be illegal. China, Russia, and Iran are some of the countries which don’t allow the use of VPN services. Next, are those countries which allow the use of VPNs. It will not be considered a criminal activity if a person uses a VPN to access a service or content available on the internet. But it also does not mean that everything comes under the realm of legal activity when done using VPN in such countries. It is just that accessing geo-restricted content, on one of the services to which you are subscribed, won’t make you a criminal. However, it can be considered a breach of the contract between the user and Netflix. It gives Netflix the right to act against such a user. The implications can include the cancellation of the user’s subscription to the service. There can be the case that a US citizen, who has a Netflix subscription, goes for a vacation in some foreign country, let’s say England. When this person will sit down to ‘Netflix and chill’ in her hotel room as it is too chilly to roam around on the streets of London at night, she will find out that doesn’t have access to her favorite show on the service anymore. But the last episode was a cliffhanger, and she wants to watch what happens next before her friends start talking about it on Facebook. This compels her to use a VPN to connect to one of the US serves and watch the show. It is a grey area when one discusses if it is a breach of contract in this case. Netflix would say that it is a breach of contract as the person accessed the content which Netflix doesn’t avail in that particular region. In the user’s defense, one can say that she subscribed to Netflix US, and since that show is available in the content library of Netflix US, she has got the right to watch it. Sadly, in this case, the Netflix will have the upper hand even though the user has a valid point. As the jurisdiction changes, the laws also change. It means is a show is not available on Netflix in the UK, then the rule applies to all the Netflix subscribers in the UK irrespective of the country where they got the subscription. However, this also should just be a breach of civil contract and not a criminal activity. We don’t want to provoke anyone into bypassing the geo restrictions of Netflix. We just expressed our thoughts on the legality of bypassing geo restrictions on Netflix. We expect our readers to be responsible lawful citizens and follow the law of the land. How VPN Providers Unblock the content? We mentioned the various ways which Netflix may be using to detect VPN connections on the service. The VPN services are also aware of the different ways by which they are being detected, and therefore, they keep coming up with solutions to ditch the detection. The most common way for the services to detect a VPN is through the IP address. They match it with the VPN IP addresses in their database and block the ones which are from the VPNs. All the good VPN services keep changing the IP address of their servers. This makes it difficult for the services to keep track of the IP addresses which belong to a VPN service. Some VPN services also offer a dedicated IP address to their users. Dedicated IP addresses are even harder to mark, and most of the times, the dedicated IP addresses easily circumvent the geo restrictions. However, there are a few drawbacks associated with a dedicated IP address. Firstly, it comes with some additional charges from the VPN service, and secondly, it undermines the privacy of the user in some ways. When the user connects through a shared IP address on the VPN, it is tough to identify one particular user as a lot of the others are also using the same IP address. Therefore, it helps the user to stay anonymous on the network. In case of dedicated IP addresses, it is easier to trace back the connections to the user, hence, not advisable. The next commonly used method to ban VPN connections is port blocking. The service providers tend to block the ports which are commonly used by VPNs. However, the solution to this problem is fairly simple for VPN service providers. They move to the lesser known ports when it comes to bypassing geo restrictions. Some VPN services allow the user to configure custom port settings as well. The most lethal weapon that governments and services have against VPN services is the use of DPI (deep packet inspection). The transmission of information and data over the internet can be thought of as the data packets being sent from one place to another. The VPN data packets are different from the usual data packets because of the use of encryptions and protocols. With the use of DPI, one can detect a data packet from a VPN connection and therefore, block it. Even though this deep packet inspection can detect the VPN data packets, it cannot read the content inside it because of the robust encryption used by the VPN services. However, it makes it easy for the governments and services to identify and subsequently block any such traffic. But nothing is perfect, and VPN services have now got an option to tame this beast as well. The use of Obfsproxy technology comes handy in such situations. It obfuscates the VPN data packets in such a way that they appear as normal data packets and get through the deep packet inspection without getting noticed. It is because of this technology that a lot of the VPN services now boast of a service which works in China as well. We are sure that there will be more ways to detect VPN connections in the future and surer that there will be methods to counter them as well. There are a few things that one should keep in mind before subscribing to a VPN service which should work even with Netflix. We have got a few recommendations which we will mention in the next section, but we consider it our responsibility to inform the users about the features that they should look for before getting a VPN for Netflix. The first and foremost thing that you should look for in a VPN service is that it should have all the attributes mentioned in the previous section. The features which we mentioned in the previous section ensure that the VPN service can bypass the geo restrictions applied not just by Netflix but from a lot of other services as well. The next thing that you should consider when getting a VPN for Netflix is the speed on the service. It is no fun watching your favorite show when it is buffering all the time, or the stream is low-quality. All the VPNs affect the original internet speed. However, some affect it more than others. There are some VPN services which provide virtually the same speed on the network, but then there is a possibility that they may be lacking in the security department. Which brings us to the next feature that one should check, and it is the security measures on the service. While encryptions and protocols always undergo scrutiny when one gets a VPN service, you need to make sure that the VPN service has got the additional security features as well. Kill switch is on such feature. It automatically stops the internet traffic if the VPN connection misbehaves in any way. Some of you may wonder how this will help. Well if you are watching a show using the VPN and the VPN connection drops, but your device still tries to establish a connection with the Netflix servers through the regular unsecured internet. Netflix can detect the change in the nature of the connection and therefore conclude that you were using a VPN to watch geo-restricted content. On the other hand, if the kill switch were active, there would not have been any unsecured connection. And the service would not have been able to make out that you were connected to it through a VPN. Another factor which one should consider before getting a VPN service is that it helps the user to remain anonymous on the internet. This might not have much relevance to the user wanting to watch content on Netflix, but it is one of the prime functions of the VPN service to keep the user anonymous on the internet and preserve the privacy. The service should have a strict no-logs policy and should hail from a country which does not curtail the privacy of citizens and users. Let us now have a look at the VPN services which we feel are the best ones when it comes to choosing a VPN for Netflix. There are many services which claim to provide unblocking of Netflix content. But, it is not just access to the content that you require but also goos streaming speed (without buffer issues) to conveniently view your favorite shows or movies. Here are some proven products you can try! It is not just the more than 5000 server locations on this impressive VPN service, but the fact that it provides obfuscated servers which will let you bypass the Netflix geo restrictions with ease makes us recommend it. The VPN traffic through these servers is masked as such so that the firewalls detect it as regular internet traffic only. This Panama based VPN service takes care of your privacy with its no-logs policy, strong encryption and secure protocols. It has also got a kill switch which will save you from any mishaps, and features such as double-VPN are available for that added layer of security if needed. This VPN service offers Chameleon protocol to its users. The specialty of this protocol is that it doesn’t let the firewall detect the VPN traffic. It does so by masking the VPN traffic as regular traffic which then prevents the restrictive firewalls from detecting it or blocking it. This protocol is helpful not just to access the restricted content on Netflix, but also to use VPN in countries such as China and Russia where VPNs are banned. With more than 700 server locations and great speed on the network, Vypr VPN might just be the best VPN for the job. PureVPN allows port forwarding and has its own DNS servers. Both these factors contribute to the service’s ability to bypass the geo restrictions put in place by Netflix. 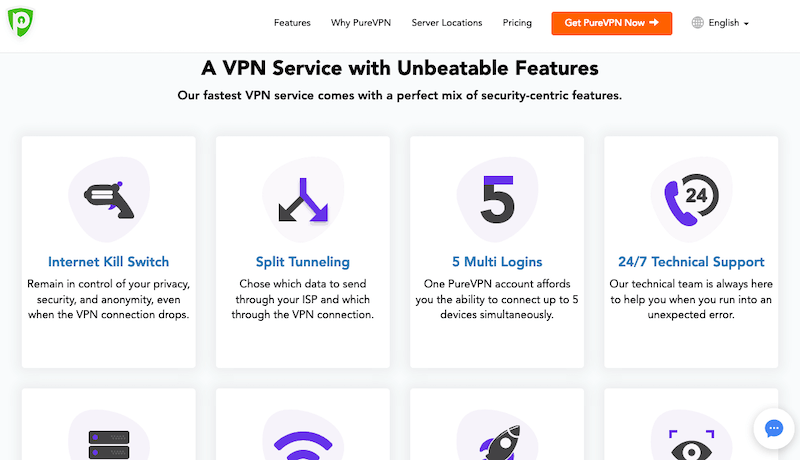 The server network of PureVPN covers a good part of regions such as Asia and Oceania along with the usual North American and European regions. This means you can watch Netflix in more holiday locations. The service has a ‘Stream’ mode which makes it easy for the user to connect to the content streaming services. The speeds on the VPN are also suited to viewing high-quality content. The service is based in Hong Kong and follows a strict no-logs policy which suggests that there is nothing much to worry when it comes to privacy on the network. This is an excellent VPN when it comes to access Netflix from any part of the world. The user can access the shows and movies, and watch them at high-quality settings as well. The speed on the service and the multiple protocols available on the service make it stand out from the rest. The user does not need to worry about privacy as they follow a zero logs policy for the matters related to the online activities of the users. Connecting to Netflix is as simple as connecting to one of the VPN servers in the US. The service does not offer any dedicated server for streaming. But the user may not feel the need for it as all the servers work fine for streaming. It is one of the more popular VPN services and bit on the expensive side of the spectrum as well. The speed on the service is good enough for you to watch your favorite shows at high resolution. With more than 148 servers in the network, it will allow you to bypass a lot of the geo restrictions including the one of Netflix. The service does a very good job of keeping you anonymous on the internet, and the kill switch prevents Netflix from knowing that you are using a VPN service. The service has been known to bypass the geo restrictions of Netflix and other services easily. However, one drawback that we discovered on ExpressVPN is that it does not offers an efficient server sorting mechanism to the users. One can sort the servers by the region but not by a specific function such as streaming or P2P file sharing.